Don’t get caught with an empty tank. 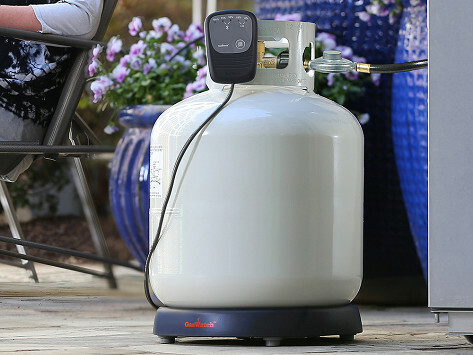 This digital propane tank monitor keeps an eye on propane levels with a digital scale. Check the display for alerts or receive them on the app that also tracks cooking time. Note: The LED display indicates when the device is connected to Bluetooth and will not display gas percentage when connected. Not to be used with loads over 43 lbs. It is suitable for tare weights (empty tank weight) of 16.6 lbs., 17 lbs., 17.6 lbs., 18 lbs., and 19 lbs. We're very happy with the GasWatch scale. Finally something that actually works! Finally something that actually works! Tried many other devices and they did not work accurately or at all. This investment of $30 an incredible bargain for a quality device. After using mine I Purchased five of them for my relatives as Christmas gifts. Don’t be skeptical this is the real deal. We are looking forward to being able to monitor our tank better now! Ordering was easy! Shipped quickly! This is a very useful item for the patio. I do not think that we’ll suffer the frustration of our tasty ribeyes being 1/2 cooked running out of gas again. I do not think we’ll end up with 1/2 cooked rib-eyes again. I love that my iPhone alerts me if we’re low or out of LPG. Keep track of the level on the digital display or through the app, which also has programmable cooking timer. The system is easy to integrate with your grill, and is a great way to make sure you never get caught with an empty tank.